The term ’stem’ refers to the structure which provides support for the plant and connects the roots (which draw up water and nutrients) to the leaves (which produce energy) and flowers (which are in charge of reproduction). There can be one stem originating from the roots with lateral stems growing from it, many different stems coming out from the roots, or a combination of the two. Where there is just one stem coming from the roots of a woody perennial this is known as a ‘trunk’. These different terms are all used to describe stems which come out of the main stem. Generally this growth is slightly slimmer than the main stem or ‘trunk’ of the plant. Nodes are areas of growth. These parts of the stem contain a lot of cells which are called ‘meristematic‘; cells which actively divide to create lots of new cells. Nodes are where you will find buds, side shoots, leaves and flowers growing. Nodes are important when propagating plants by stem cuttings. This is the space between two nodes. It is the area which extends to give the stem more length and, therefore, the plant more height. It is also known as the ‘internodal’ area. These are buds which form in the axils between a stem and a side shoot, or between a stem and a leaf. These buds may remain dormant or may develop into a side shoot, leaf or flower. This type of bud is found at the tip of stems and denotes a strongly meristematic area, ie an area where cells are actively dividing and, therefore, lengthening the stem. At these apical growth points there is a build up of a hormone called auxin, which controls the growth. The heightened levels of auxin at the tips of stems inhibits the axillary buds (this is called ‘apical dominance’) and is the reason why they often remain dormant. When we prune plants we remove the apical buds, which encourages more growth from the axillary buds. This is why plants often become more bushy with pruning . The leaves are either sessile (growing directly out of the stem) or petiolate (growing on a stalk called a petiole). 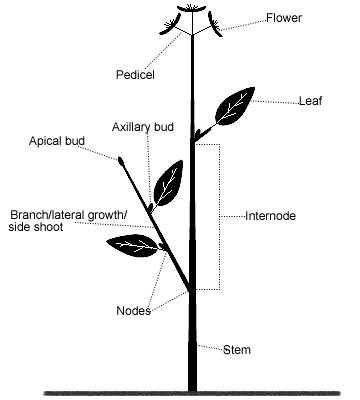 Leaves grow out of nodes and the point where the leaf or petiole meets the stem is called the leaf axil. See ‘parts of a flower‘. The internal structure of a stem varies depending on the type of plant. Its basic constituents are the phloem and xylem vessels which form the plant’s transportation system, meristematic ‘cambium’ cells which are actively dividing cells producing more phloem and xylem tissue, and cortex cells which fill in the gaps between the other types of cells and can also store food or become meristematic (growing) in order to repair damage to the stem. In woody perennials, and some other plants, the ongoing production of phloem and xylem cells is responsible for the thickening of the plant’s stems. This increase in width stretches and squashes the epidermis, or ’skin’, of the stem, so the plant has to keep on producing new epidermal cells. The old, dead cells build up and appear as bark on the outside of the stem. Tiny pores (which appear as spots on some stems) called ‘lenticels’ allow gases (such as oxygen) to enter and leave the inside of the stem, used for purposes such as respiration.